"We would like to work as ambassadors from our planet, hopefully spreading words of wisdom and encouragement to many beings of your planet so you can move forward into higher dimensions and continue towards a more enlightened civilization." "Your planet thinks of death in such a negative way. There are many planets where souls come and go quite freely from physical to non-physical body. There were even times on your planet when this occurred. Death is but a change; there’s nothing to fear. You are not gone; you continue moving, changing and developing." "There are forms of Light beyond human comprehension. It is not like your Sun or electricity or candlelight. It is a Light that burns within each and every soul connected to higher consciousness. It is your connection to God and All That Is." "We have compassion for humanity. We see it making choices that we’ve made in the past and we’d like to guide you towards a better future — like an older sibling assisting a younger one." Imagine that you were visited by wise and compassionate beings from other dimensions. These celestial teachers represent humanity’s future. They can answer all of your questions about life and death, good and evil, free will and fate. What would you ask? Imagine that you are an ambassador between worlds. Your message will teach universal laws, raise consciousness and inspire hope. It could also save humanity from global warming and other problems on the Earth. How would you share this message with others? 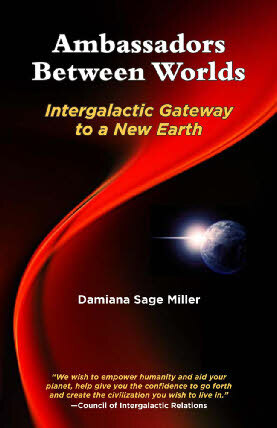 AMBASSADORS BETWEEN WORLDS, Intergalactic Gateway to a New Earth, is a collection of amazing and profound conversations with enlightened extraterrestrials. Topics include the nature of God, evolution of the soul, finding your purpose, living your passion, cleaning up the environment, and developing new energy resources. You will also learn about past lives, future lives, the true nature of time, universal laws, Atlantis, ancient Egypt, advanced technology, alternative energy, hidden dimensions, the real cause of disease, angels, archangels, nature spirits, spiritual guides, shadow governments, why the UFO cover-up is allowed to persist, and much more. How do advanced extraterrestrials live? How do they raise their children? Do they have animals? What do they eat? What do extraterrestrials think about our religious beliefs, sexual attitudes, and goals in life? How can we achieve global peace? Why do extraterrestrials want to assist humanity? Damiana Sage Miller is an intergalactic ambassador for benevolent extraterrestrials from advanced civilizations. She also receives messages from ascended masters, angels, archangels, and other beings of Light, sharing their messages of love and hope. She is also the author of Third Eye Awakening, Adventures of a Clairvoyant Traveler.